One of the purposes of the GAB is to celebrate outstanding Georgia broadcasters, like Elmo Ellis in the 1970s. Radio stations do not own the music they play. Instead, they license the music from groups like the American Society of Composers, Authors, and Publishers (ASCAP). In the 1930s, ASCAP had a monopoly on recorded music for public performance, which meant they could set the price. Individual stations had little power to do anything about this. In 1935 three men, W.T. Knight from WTOC (Savannah), E. K. Cargill from WMAZ (Macon), and Steve Cisler from WJTL (Atlanta), organized a meeting to discuss changing the situation. By forming the Georgia Association of Broadcasters, stations across the state were able to act as a group in negotiations with ASCAP, allowing them to negotiate a better price on music licensing. The Georgia Association of Broadcasters continued on as a group to support and celebrate Georgia broadcasters. 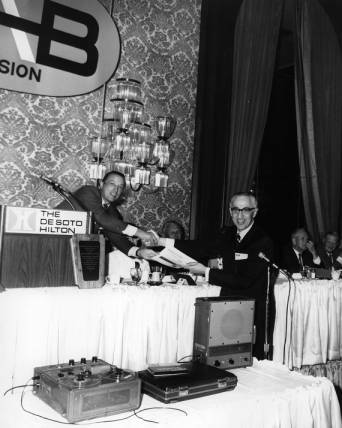 In 1946 GAB supported the founding of the Georgia Radio Institute to bring together state broadcasters to discuss problems and host speakers. The group also endorsed a set of ethics for broadcasters and currently cooperates with the FCC and the Georgia Emergency Management Agency.